Is a contact print from a 10x8 large format neg better than a 10x8 enlargement from a sheet of 5x4 film? Well, it seems that the answer depends on who you're asking. I've been reading up on this subject for the last couple of days and I don't believe there's anything really definitive out there one way or the other. Last week I posted a video about the art of large format photography which elicited some excellent comments. It was these that got me thinking. David M wrote, "The only thing missing from this film is a demonstration of the astonishing texture and detail which is one of the glories of LF photography, particularly in contact prints. "Alas, this is not possible on even the finest screen (enlarged details don't have the same impact) and we must seek out and view physical examples. Many LF photographers speak of the shock of a face-to-face encounter with an actual print and their immediate conversion to the art of Inconvenient Image Making." Doug H chimed in along the same lines saying, "The problem that many have with LF is that they stop at 4X5, then exclaim what's the big deal? With today's 35mm & MF films and associated developers, 4X5 is overkill. Unless you are needing perspective control movements, etc., the smaller formats are more than adequate. "To see the power of LF, you need at least a 5X7 contact print. For my 8X10 camera, I carry a 5X7 reducing back for when the subject needs a different aspect ratio. 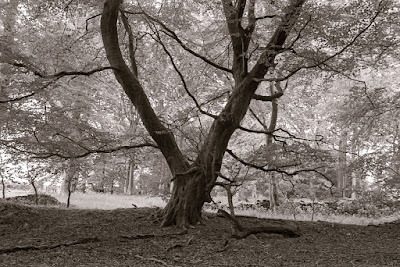 Printed on good paper (eg, Ilford Gallerie, Fomalux or Lodima), the image will pull you in." For someone who is predominantly a 35mm and medium format photographer and who thought he was doing well trying 5x4 on a Speed Graphic, it's unsettling to read that I've only managed to get a small flavour of what LF is really all about: larger formats and contact prints. So off I went to see what the general consensus was with regard to contact prints and enlargements. What I found was that there was a slight majority who said the contact print was superior and a sizeable minority who felt enlargements (from a 5x4 neg to 10x8) were better than a 10x8 contact print. Obviously, this isn't scientific but just the results of some quick Googling. The feeling I got, though, was that proponents of the contact print were a little like those Leica users who say that their lenses are better or different in some way without ever being able to demonstrate or quantify their claims. I hope that doesn't sound unfair but it's the impression I was left with. And yet, David M and Doug H certainly sounded convincing concerning the contact printing malarkey. What qualities might a 10x8 contact print have that a very modest enlargement from a 5x4 negative to the same size wouldn't? In arriving at an answer we have to consider grain, detail and tonality. With a medium speed film there's no issue with grain in a 5x4 enlargement to 10x8 so I don't think that plays a role. Some people believe that enlargements from 5x4 can actually be sharper than a contact print of the same size whilst others say the opposite but, whatever, there seems to be nothing cut and dried where detail is concerned. Tonality and texture is where the contact print seems to score from what I can fathom. It appears that contact prints can seem more "life-like" than enlargements. I've read too many comments to the effect that texture, such as sand, snow or stonework, is more realistically rendered in the contact print to doubt that there's something in this. This seems to be what separates the two - at least as far as those photographers who see a difference are concerned. I know that there are a number of large format photographers amongst my readers so I'd like to invite you to give your opinions in the comments on the enlarging v contact printing issue. Is one really better than the other? Does any superiority only manifest itself in a particular type of subject? Or, for all intents and purposes, is there so little to choose between the two that the photographer is just as well going with whatever he feels most comfortable doing? A 1950s half plate Kodak Specialist - a heavy but superbly made beast. Finally, regular readers might recall that I won a 5x7 Kodak Specialist camera at a local auction (you can read about it here and here) late last year. What's stopped me trying it out with paper negatives has been the condition of the dark slides that came with it. None of them looked particularly light tight without a bit of work and I just haven't got round to it yet. 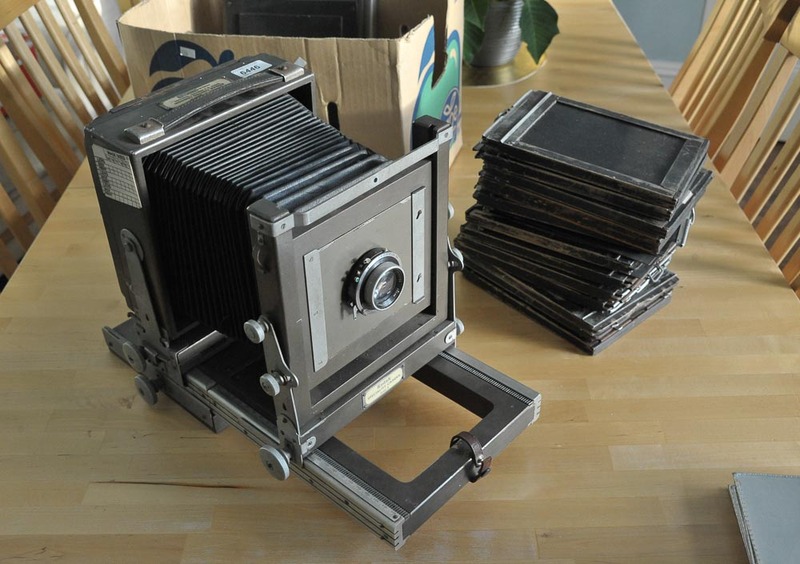 To be honest, I had intended selling it on but this talk of large format and contact prints has left me feeling that it would be a shame if I didn't give it a whirl. So I'm going to try it out with some darkroom paper to check for light leaks, do any repairs necessary and contact print the negs. If any 5x7 or half plate users out there would like to sell me half a dozen sheets of film (any type, even out of date) to give contact printing with film a go, that would be great. Please email me. Film in this size is quite expensive and I don't want to splash out £50-£60 on some FP4 Plus until I've at least tried my hand with the camera. To me, the real advantage of the larger negatives is what you can do with them & what darkroom conditions you work in. If you are printing on enlarging paper, there may only be s alight advantage in texture & tonality, as you suggest. The big advantage comes with using contact printing paper (eg, Lodima, Fomalux, Collodion POP) in that you can work in very adequate light (I use bug-lite bulbs) for spot developing small areas of a print. These papers also seem to have special qualities such as giving depth to a landscape scene. Larger negatives also give you the advantage of alternative process printing such as pt/pd. Bruce - if you're looking for a cheap way to get your bearings with larger formats have you considered X-Ray film? Though it doesn't come any smaller than 8x10 it's cheaper than some of the brands of dirt. For the price it couldn't be too hard to trim down. If I'm not mistaken it can even be handled under safe-light conditions. I found this supplier in the US, though I'm sure a quick Google would find you something similar in the UK. At $32/100 sheets (200 sheets if you trim to 5x7) you can hardly go wrong. This is a subject shrouded in subjectivity. I remember seeing a 20x30 (ish) Victorian contact print from a collodion neg at the British Library's exhibition of photography and couldn't tear myself away. Quite astonishing. Clearly a perfect contact print from a larger perfect negative ought to be better, or at least sharper and smoother. It might be difficult to spot any difference in sharpness at normal viewing distances (another subject of prolonged dispute). I'm inclined to believe that with decent workmanship and decent equipment, an enlargement from say, 5x4 or 7x5 to 10x8 will be very hard to distinguish from a contact print. In both cases, there will be "wasted" or unused detail in the original that would only be visible with higher magnification – a bigger print or under a microscope. This assumes a subject with detail in it, to be resolved, of course. In many cases 120 film may look as sharp in a 10x8 size print. John Davies for instance, used roll-film cameras, claiming that there was an advantage in the thinner emulsion. He was very particular indeed about developing his negs, and a very fine printer, too. Claims are made for improved tonality in the contact print, and I believe that this is possible for careful workers. There are quite a few specialist developers that claim to give subtly improved results. Not me, I get a bit too optimistic about exposure and development. What I think we are talking about is the sensation that, if we only looked just a little bit closer, there would be more detail available for us to see. (Rather like real life.) So if the detail holds up until we are too close to focus, then I think we have all that we could wish for in sharpness, texture and detail. I find this limit is often reached in enlargements from 35mm but seldom in large format. It may be that instant conversions to LF happen to people who have only seen prints from 35mm or modest digital cameras. Sharpness isn't the only virtue, of course, but a means to an end. Many pictures will gain little benefit from having extra detail. For instance, Capa's (currently disputed) pictures of the D-Day landings seem to gain from their graininess and blur. Perhaps it's in the field of alternative printing that the contact print comes fully into its own. The hand-crafted, one-off neg can be primped and primed to be exactly what the print material requires. Additionally, many photographers find great personal satisfaction and fulfilment in working in particularly specialised and ostensibly inconvenient ways and we shouldn't discount or decry this. Many observers like to think of the effort and skill that was needed and value it very highly. On the other hand, I suggest that we do discount all references to the soul as an attribute of prints. We can conveniently leave that sort of thing to a man wearing white clothes in Rome. I can't understand why you're comparing a 5x4 contact print to an enlarged 10x8 print from the same neg because they're both different sizes, no? There are plenty of reasons for using large format over medium format even if you're not making big prints and that is lens choice. There are lenses you can get for large format cameras that just don't work on medium format cameras especially old uncoated varieties that give you a very unique look. I shoot plenty of 5x4 and when time allows 10x8 too. I've cut x-ray film sheets down to 5x4 and it worked fine. The film I used can be handled under a safelight so I could see what I was doing which helped a lot. The comparison is between a 10x8 contact print and a 5x4 negative enlarged to 10x8. What kind of x-ray film do you use? Joe, above, suggested I might try x-ray film but the only reasonably-priced version I could see was called Photon and I've no idea what it woud be like. Bruce- The link to the specific product page I had in mind is for the 8x10 Fuji. My LF efforts are currently on hold pending the resolution of shutter problems so I am frankly still waiting to try this out myself. As for the look however, the green sensitive should give results similar to standard ortho films. The oddest thing about this stuff is that it has emulsion on both sides - a bugger for tray processing but no worries about loading it backwards in the film holders I guess. Wow, I have to strongly disagree. Based purely on the obvious the contact print is going to win. Enlarging a lower resolution image to 8x10 is NEVER going to hold as much image information as a native 1:1 8x10 contact print. The fact that you're projecting through the 4x5 to enlarge it is GOING to reduce sharpness as it increases the optical size of the image containing grains. Now in practical sense, a 4x5 enlargement is still a spectacular thing and epically lovely and more than enough for nearly anything you would ever want to do. And it's certainly easier to shoot than large LF images. I hope this helps, I might give it a go sometime myself. This suggests that somehow 4x5 film is no longer being improved, for surely the only way for 35mm to compete with a sheet of 5x4 film is for the smaller negative to hold a technical advantage over the larger format ? But thats not the case. A quick look on the internet and I can buy the latest Adox films in 5x4, Kodak T-max films (100 & 400), Fuji Acros 100 and all the Ilford range. I can even get Rollei's 400 infrared in 5 x4. All this took me a few minutes looking at online camera stores. So how exactly, is 35mm surpassing 5x4 if there is no technical advantage and I can use the same film and developers ? If it is true ( unlikely) then surely the first casualties of of such events would be the very largest of formats, not the ones in the middle ? It doesn't seem to be exactly the same stuff but it's the only Fuji x-ray film I could find in the UK. Not sure if it would be better or worse. It seems to be even more expensive on the medical suppliers' websites. I'm hoping to look at the sharpness thing when I get a chance. At the end of the day, anything above 30 lines per mm is generally accepted to be beyond human vision. A 10x8 neg may well contain much more info than that but it would be largely irrelevant if much of it couldn't be seen in the print. A 5x4 neg given a 2x enlargement to 10x8 may still produce 30 lpm in which case it would appear just as sharp - or at least would be resolving the same detail - as a 10x8 contact print. At the end of the day, a negative may be capable of very high resolution but once the 30 lpm threshold is met the issue becomes largely moot. Thanks for the reply. Yes I completely understand what you are saying, it's just that's not what Doug H is saying. I don't understand the logic of his argument. He's claiming that 5x4, and only 5x4 is overkill. Not 7x5, or 10x8 or indeed 24x20. So if 35mm or 120mm is 'as good' as 5x4 then why use 5x4 ? is what he's asking. Well, what I'm asking is if thats the case, then why use 10x8 when surely 5x4 will do just as good a job according to his rule of thumb. And then why use, say a 20 x 16 camera when surely a 10 x 8 would suffice ? Using the logic of this argument surely means that it would be the very largest of formats that would be the victims ? Think of other analogue examples. Audio tape gives a better quality when you record using a faster tape speed because you physically store the information on more tape. Even in the digital world, a 1mb image carries less information than a 5mb image. So, while I totally accept and agree that the human eye can only discern a certain amount of information, I'm not quite ready to dismiss fundamental laws of physics and chemistry. The larger the recording format, the better quality. "We have to pay a slightly different price for most things over here..."
Slightly different indeed, remind me not to break any bones if I'm in the UK. I get supplies from the US (to Canada) fairly regularly but they only need to cross a river, not an ocean. I should add that while the double emulsion is just fine for contact printing, the standard practice when using x-ray negatives in an enlarger is to bleach one side. This is probably why it's far more popular with larger format shooters than those of us who must make due with tiny little 4x5 negatives. Bruce's original question was: "Is a contact print from a 10x8 large format neg better than a 10x8 enlargement from a sheet of 5x4 film?" So my statement was about 4X5 being overkill for that scenario. Certainly if you wanted a larger enlarged print, there would be a point at which 4X5 or larger negative would be advantageous vs 35mm or MF. Hopefully, this will clarify what I originally said. A first post from a so far silent reader. I was doing a few 5x7" contact many years ago and I never enlarged my 4X5" negs to more than 8x10". But I've allways contacted on glossy paper and enlarged on matt paper, so the comparison may not be valid. Anyway, my impression is, that the enlargements were very, I mean VERY, nice, but the contacts are something totally different - the amount of details and the tonality is just phenomenal, for me the contact wins hands down. But then - so what ? Does this make a better picture ? After all, a boring picture is a boring picture, no matter how much detail and texture there is. May I ask you a question Bruce : I see what you make out of your MF and especially your 35mm tools - the results are just so nice. These tools seem to suit you very well and you seem to be at ease with them. I wonder why you bother at all about LF, what are your expectations ? Thanks, Jörg. I think I'd agree that I'm a 35mm photographer by inclination. I love the Rolleiflex TLR as well. LF? I suppose it's different and can be fun. The contact printing side of things is intriguing, too. I don't think I've ever seen a 5x7 or larger contact print and I don't think I'll rest until I do - especially having read what people have said about it, including yourself. I've just been reading an article on secret writing. We all know about the lemon juice trick but that's not relevant here. What caught my eye was a reference to micro dots – very small photographs of a document, affixed to an ostensibly innocent letter in the form of a full stop. Clearly the resolution is very high indeed and entirely and intentionally exceeds the ability of the human eye. Microfilm illustrates the same point – that a negative can comfortably contain invisible or unreadable information. Somewhere I recall reading of someone (was it by AA?) seeing a bigger enlargement of a familiar image. The writer had already been impressed by seeing "every leaf" but was astonished to see insect holes in those leaves in the bigger print. So, it seems to be evident that an enlargement from a negative with plenty of "surplus" detail must be able to mimic a contact print from a larger neg, always assuming decent workmanship, equipment and materials. Some enlarging systems may possibly introduce distinctive artefacts, that a very experienced observer might notice. Perhaps they might only notice the artefacts from their own system. How could they do it for an alien enlarger or contact frame? The glass used in contact frames might introduce artefacts (faint double-imaging by total internal reflection?) too. I'm very, very unsure about this. But we might like to bear in mind the example of chicken-sexers, who are able to distinguish male from female day-old chicks by using clues that they cannot explain or point out. I'm discounting things like the outline of the film and the imprint of the holder, because, to my dismay, I've discovered that there's an App for that. I suggest that we are assuming some sort of standard observer in this discussion; informed, intelligent, with good eyesight and in decent viewing conditions. And I further suggest that we are looking for a reliable and repeatable way to discover perceptible differences between the alternatives. The only way to resolve the matter is probably not rhetorically but by blind or double-blind testing, with a wide variety of observers and images. I'm not volunteering, but someone may care to take up the challenge, if they have a point to prove. Any prospective PhD photography students out there? And another thing. We seldom hear this debate applied to colour prints. Quite modest sharpness (by B+W, LF standards) seems to satisfy most people. The edges in a colour print are defined by red, green and blue (or CMYK, if you like) as well as by density, which many make a difference to how we evaluate and observe the print. A red/green boundary may well appear sharper (or better defined) than a grey/grey one, or it may be that the visual part of brain is sufficiently occupied by decoding colour information. In that case, unsharpness may only matter when it becomes obtrusive. There doesn't seem to be much debate about the moral worth of digital colour printing, either. More material for discussion here. And another, another thing. if the emulsion of the neg is in very close contact with the emulsion of the print, the light source should make no difference, as far as I can see. If there were a spacer, as in making unsharp masks, things might be slightly, but very slightly, different. In any case, we want an unsharp mask to be unsharp. Enough. Too much in fact. I'd suggest using normal, panchromatic, Foma 5x7" film and Fomalux contact paper. Both are standard stock items over here (Netherlands) by mail-order from Maco, or equivalent. The film is half the price of Ilford and very acceptable - with 'slow' photography, use an EI that is half the ISO. In addition to using an enlarger, try also to make a contact print with a small lamp, far above the paper, to see if the Callier effect has any influence on your results. I have only used an enlarger as a light-source and wonder if I am missing anything with my pinhole-negs! Illuminating your contact print with an enlarger is already very similar to using a small bulb. You could try this exercise. Put a mirror on the baseboard and look at the illuminated disc of the lens's diaphragm. This is your effective light source. The light from the enlarger lens is already collimated. Now look at your proposed bulb in the same way. I suspect that you'll find they are not meaningfully different. Moving the head and altering the aperture will give wide a range of possibilities for experiment. It's also remotely possible that the naked light bulb, reflected from the walls of a small room, may provide some inadvertent quasi-diffusion. The Callier effect operates on the individual silver halide grains of the image and is magnified by the throw of the light beam. In a contact print, this throw cannot be greater than the thickness of the emulsion, or rather, the distance from the individual grain to the paper. Its actual size would be smaller than the size of the grain of silver itself. You may see a change in contrast, but this isn't the same as sharpness, although the two can be confused. A contrasty print with lower resolution often looks subjetively sharper, even though it resolves less detail. Returning to the original 5x4 v 10x8 question, it's just occurred to me that a 5x4 neg, enlarged with a point-source enlarger might (might!) appear slightly sharper than a 10x8 contact print and so seem to be "better" in that way. Both negs would still have detail that wasn't visible to the naked eye and would remain unseen in either print. Always assuming that both negs are sharp and properly made, of course. And in this discussion we should always remember that a picture may exhibit other and more valuable qualities than sharpness and smoothness of tone. Contact prints are (obviously) better than enlargements as they are lossless. The distance between the neg and the paper is what we are up against and since a contact print is emulsion to emulsion, the images are spectacular, provided the negative is "good". Take a look at the work of Michael A. Smith and Paula Chamlee. Contact printing at its finest. They are in the USA and shoot large format, 5x7 to 17x22 inches in size depending on the subject matter. Very good work. Develop negatives by inspection and contact print on older Kodak Azo or their own paper, Lodima. Develop in Amidol developer. Worth the time to check out their work and writings. Have you ever contact printed a 35mm negative, we all have probably? I was in school too many years before I lived someplace with a darkroom. I was a drugstore print guy before that. When I saw my first contact prints of 35mm I said these are great and I can't wait to enlarge. Big disappointment; the enlargements never had the tones of those tiny contacts.